Juneteenth is the celebration to commemorate the end of slavery in the U.S. It started in Galveston, Texas in 1865. On this Father's Day, I'd like to thank my forefathers for enduring the trip across the Atlantic, enduring years of slavery, standing strong during Jim Crow, fighting for civil rights, demanding to be called a man, and raising two great people that I call my parents. You set the bar of excellence and I hope that I live a life that makes you proud when you look down from above. 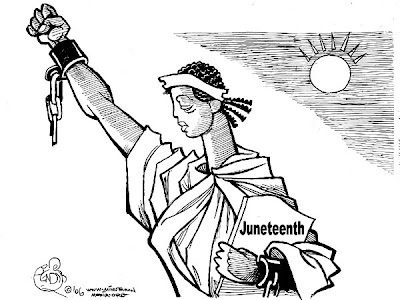 For more information about Juneteenth, please visit the junteenth website.